Knit your first pair of toe-up slipper socks. Socks knit with worsted weight yarn are perfect for lounging. 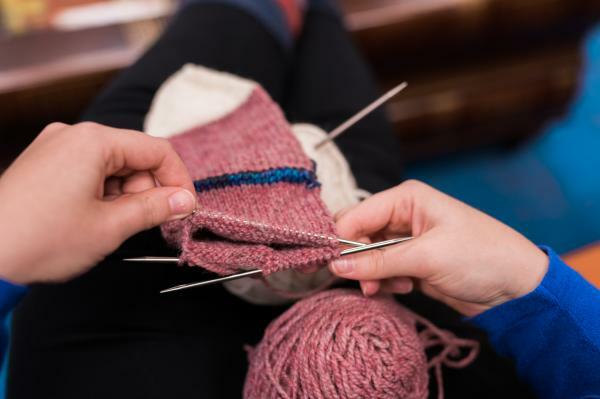 Learn how to cast on and knit with double-pointed needles and make an afterthought heel. This is a 4-day class. Classes meet from 10 a.m. to 11:30 a.m. on Mondays from October 8 to 29. Day 1: Cast on with Judy's Magic Cast, work toe increases and the foot. Day 2: Place the heel stitches with waste yarn and work the leg. Day 3: Knit ribbed cuff and bind off with a stretchy bind off. Day 4: Pick up the heel stitches and create heel. Note: An accurate foot measurement is required for this class. Be prepared to measure your foot or bring the following measurements: circumference around the ball of the foot and length from the back of the heel to the longest toe to the first class. Note: Basic knitting skills (including casting on, the knit stitch, the purl stitch, and binding off) are necessary to start this project. New to knitting? Check out our beginning Knit It series of classes at www.ocls.info/classes.